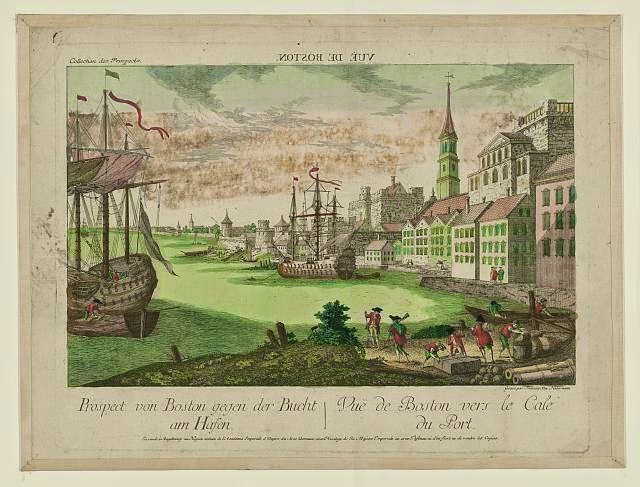 "Vuë de Boston," Francis Xaver Habermann, 1770's, Library of Congress. As I have said before, Habermann is not the most reliable source for sailor's dress in the American colonies. He is a German artist who creates his works from a strictly European perspective. The geography, architecture, and dress of the figures all betray this. Still, any attempt at an exhaustive study of primary source images portraying common sailor's clothing needs to includes the outliers as well as the more trustworthy sources. Today's print is part of the "Collection of Prospects" by Habermann, portraying famous cities in North America, including New York, Quebec, and (in this case) Boston. At the far left of the frame is a large warship with a barge alongside. Aboard the barge is a sailor in a single breasted short jacket without pockets or collar, but there is too little detail to say anything about the cuffs. His cocked hat is wide with the point forward, and he wears a bright green pair of breeches with white stockings. Three tars on the ship work at the lines about the mainmast, but ignore the uncoiled line on the poop deck. They all wear round hats and jackets, two in green, one in red. Mixed with soldiers, larborers work ashore with a variety of cargoes. If not for the fact that the men at the boxes and barrels matched the clothing of the oarsman in the background, I might have categorized them as dockworkers rather than sailors. to be fair, they may still be dockworkers. I have not yet looked deeply enough into the distinctions of labor (or lack thereof) to be sure. I can say that sailors returning home from merchantmen were expected to unload the cargo before they were paid. But whether they were assisted by dockworkers or could transition into dockworkers themselves and back again, I cannot say for certain. Anyone out there with information on the classes of maritime labor, feel free to comment below! In any case, the two men at the cargo and the oarsman all wear red waistcoats and green breeches. Two of them wear matching green workcaps. Interestingly, the two men at the cargo wear neither shoes nor stockings. While I expected to see this much more often when I began my exploration of sailor's clothing, this is the first time I have really noticed it in a primary source image. This begs the question: How often did sailors go barefoot? Was it as common as we think, and simply not represented in art? Was it perhaps less common than we imagine? At the bow of the boat in the background is our final subject. He wears a black knit cap, workcap, or round hat, and white trousers. Looking a bit more closely, we can see his sleeves are rolled up well above the elbow. Though colored the same blue as his torso, the original engraving appears to have him in a waistcoat and shirtsleeves. It is not uncommon to see the original intent of the engraver changed by that of the colorist.